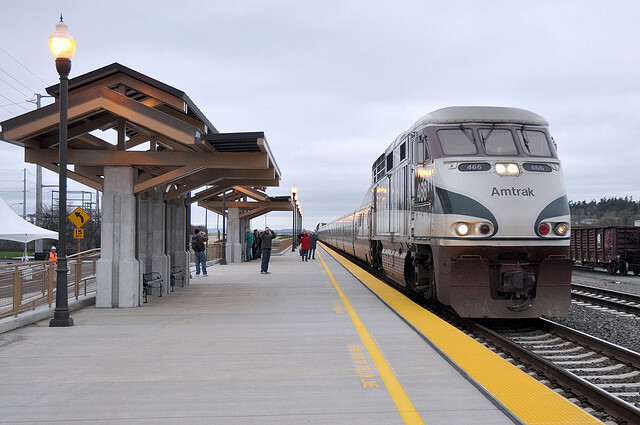 WSDOT has added a section to their website with information on passenger rail travel in the state. Pages include links to ticket purchases, status alerts, maps, high speed rail planning, and more. Amtrak Cascades southbound at Stanwood. Photo by WSDOT, released under Creative Commons. This entry was posted in Info and tagged Amtrak Cascades, WSDOT on April 19, 2012 by Adrienne Rice Adams. On Friday, the Washington Legislature passed a budget that does not include the predicted $4 million in service cuts for WSF. However, the ferry system is not yet out of the woods. The budget was passed based on the assumption that HB 2053 will be passed when legislators meet this coming week in a special session. If HB 2053 does not pass, the $4 million in service cuts will be restored. HB 2053 increases fees for a variety of licenses and the revenue generated would be used to support a variety of statewide transportation projects, including ferries. While it is not perfect and does not adequately address sustained funding, HB 2053 has received the support of Ferry Advisory Committees and governing bodies of ferry-served communities. Learn more by reading this article. Legislators respond to email from constituents. If you support HB 2053, please take a moment to drop a note to members of the House and Senate. Contact information can be found on our Contact Information page. This entry was posted in News and tagged Legislation, New revenue sources, Proposed budget cuts, WSDOT on April 25, 2011 by sjbrooksyoung. How Do Various State Agencies Work Together? In gathering documents to link to this site, it wasn’t long before Adrienne and I found ourselves lost in a sea of acronyms: for example, WSF, WSDOT, WSTC, F.R.O.G, and FAC. So we wondered if there’s an organizational chart somewhere that lists these agencies and explains how they work together to oversee the ferry system. This would help us know where to look for specific information and where to direct questions in the future. There are a few FAC members subscribed to the site and we are hoping that perhaps they know where to find such a chart or who to ask. Please let us know by posting a comment to this message and, if the chart exists online, add a link. It’s also possible that other subscribers know. If so, please let us know by posting a comment. This entry was posted in Q & A and tagged Ferry Advisory Committees, FROG, Washington State Transportation Commission, WSDOT, WSF on November 21, 2010 by sjbrooksyoung. All content on this site is copyrighted by its respective authors. Articles may not be reproduced or redistributed without prior written consent. Links, mentions, tweets and trackbacks are most welcome!